should have done Intermediate/ Graduation/ Post Graduation from recognized University. Interested and eligible candidates can apply for Assistant, Junior Clerk and other jobs through online official website of Bihar Vidhana Sabha is www.vudhanasabha.bih.nic.in. The online application forms will be available from 9th October 2018 onwards. The last date to submit the application form through online is on or before 31st October 2018. The candidates will be shortlisted based on the Computer Based examination. 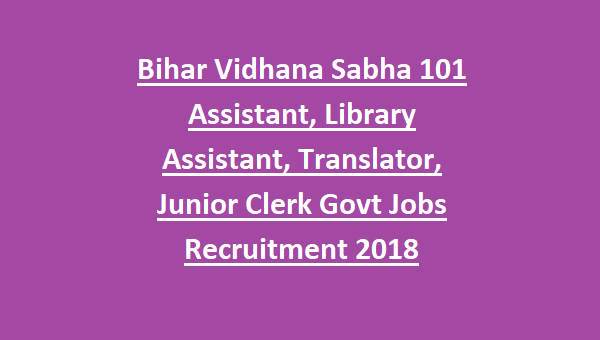 For more details of age limit, salary, application fee, exam pattern and syllabus and how to apply are given below for the Assistant, Junior Clerk and Library Assistant Posts in Bihar Vidhana Sabha Recruitment Notification 2018. 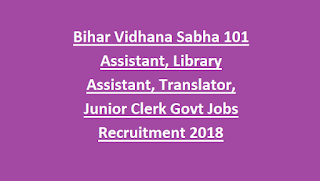 There are total 101 available vacancies for Assistant, Junior Clerk Posts in Bihar Vidhana Sabha Recruitment. As on 1-08-2018 the age limit for the candidates apply for the Junior Clerk Jobs is in between 18 – 37 years and for other jobs the age limit is in between 21 – 37 years. For Assistant, Assistant Search/ Reference, Translator (Hindi/English), Urdu Translator, Urdu Assistant, Assistant Library is – 7th CPC Pay Level-7, Rs.44900 – 142400/- plus other usual allowances as per rules. For Assistant Invaluable – 7th CPC Pay Level-4, Rs.25500 – 81100/- plus other usual allowances as per rules. For Junior Clerk - 7th CPC Pay Level-4, Rs.19900 – 63200/- plus other usual allowances as per rules. The candidate will be shortlisted on the basis of merit in CBT (Computer Based Test) Test. The exam pattern will be comprising of objective type questions of total 100 questions with total 400 marks. Interested and eligible candidates can apply for Assistant, Junior Clerk and other jobs through online official website of Bihar Vidhana Sabha is www.vudhanasabha.bih.nic.in. The online application forms will be available from 9th October 2018 onwards. The last date to submit the application form through online is on or before 31st October 2018 along with the relevant documents. Candidates can pay the application fee at the time of form submission. For other information candidates can check in the official notification.